Having Iran built most railway stations in the last 50 years they show interesting solutions of modern architecture mixed with Persian elements. Some of the major stations like Tehran, Mashad, Tabriz, Esfahan, Yazd and Shiraz have monumental character and show great elegance. With many destinations having few trains during the day, stations may be desert for hours and get crowded only during arrival or departure times. Passengers will wait in the station building until their train will be called, mostly like boarding a plane. Before boarding an ID card must be shown, foreigners must show their passport before passing the gate. Also tickets will be checked and once arriving on the platform railway staff will be helpful to find the reserved seat or compartment and to board the train. Large stations do have ticket counters selling remaining tickets for the same day but you usually should have bought your ticket in advance as trains may already be fully booked. Boarding a train without reservation is not allowed. With many destinations connected to the railway network in recent years, not all stations are located within central areas. In smaller cities along the lines from Tehran to Tabriz, Ahvaz, Kashan, Mashad and Gorgan you can usually reach them by foot from the center. In large cities like Tehran, Mashad, Tabriz, Yazd or Ahvaz stations can be reached with public transport, while it is necessary to cover the large distance between the city center and the stations of Esfahan (15 km) and Shiraz (20 km) by taxi. The distances between the stations and the ports of Bandar Abbas (6,5 km) and Khorramshahr (3 km) are best covered by taxi. Tehran central station is connected by metro line 3. The name of the metro stop is Rah Ahan. 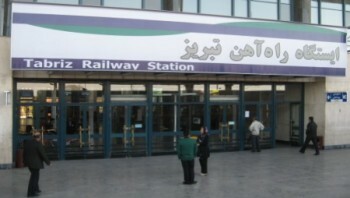 In Shiraz, the nearest metro stop to the railway station is Mirzaye Shirazi (line 1). Taxi between this stop and the railway station is about 15 minutes. New Esfahan highspeed station will be much closer to the center, near Kaveh bus terminal. Mashad and Esfahan are building new metro lines which will connect to the railway stations in the near future. Stations may have a few kiosks selling snacks, books or newspapers but usually no restaurant or shopping mall is available. Waiting rooms are comfortable, mostly air conditioned and have TV or movie entertainment. Some stations have a luggage deposit. There is always a charging station for mobiles, tablets and smartphones. Usually you get timetable information in English at the help desk. This includes information about arrival times and intermediate stops which are almost unavailable on the Internet or in a printed form. 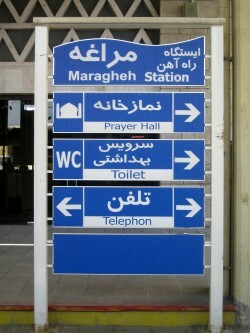 With Iran governed by a theocratic systems all stations have a mosque or prayer room and large bathroom facilities for ritual ablution. Stations all over the country are clean, well kept and safe. For a detailed list of all facilities available in larger stations download the RAJA information folder. In larger cities a special taxi service from the station to town is provided. Once you arrive you will find a central taxi desk inside the station where you book your cab for a fixed and convenient price. Non hassle or bargaining on the street is necessary. Once your car is ready you will be called. This is of course a very civilized institution you may miss at most European railway stations. 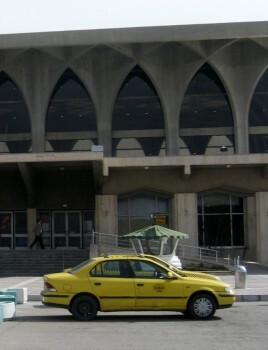 The following stations have taxi service: Tehran, Mashhad, Isfahan, Tabriz, Ahvaz, Bandar Abbas, Kerman, Yazd, Zanjan, Gorgan, Arak, Sari, Shahrud. How to reach tourist destinations by train? While most larger cities are easy reached by train, minor places may not be directly connected to the railway. Anyway, with low taxi fares also on longer distances (at least for European tourists) it is recommended to go by train to the nearest station available and then join the destination by cab. Transfers are best arranged by a travel agency (see links) or by the hotel reception. Don't relay on taxi availability in smaller stations. There will be no service. So previous arrangements are mandatory in these places. Abyaneh: this characteristic village next to the Karkas Mountain chain north of Esfahan is about 70 km away from the railway station of Kashan and best reached from there by taxi as no other public transport is available. Bam: the railway station is south of the modern city. The citadel is about 10 km from the station. Daily overnight trains from Tehran to Zahedan stop at Bam in the morning. Bandar Abbas: not so much a tourist destination, it is the main port to Queshm Island (see ferryboat timetables) and has also a ferry connection to UAE (Sharjah). Overnight trains to Tehran, Mashad and Esfahan are the most comfortable land transportation. Bushehr: the city on the Persian Gulf is not yet connected to the railway, although a line is planed. Nearest railway station is Shiraz (270 km, see bus timetables). Esfahan: for most tourists the world heritage city is a primary destination on their travel to Iran. The railway station is 15 km to the south and can be reach only by taxi (no public transport). There are trains to Tehran, Mashad, Kerman, Yazd, Zahedan and Bandar Abbas. Gorgan: the lovely town in the green region of Golestan and the nearby popular holiday destinations on the Caspian sea is today's terminal of the Trans-Iraninan Railway, with the station in walking distance from the center. The Alborz Mountains crossing line between Garmsar and Sari is probably the most scenic railway in Iran and among the most spectacular mountain rail trips worldwide, although it is little know. Besides an overnight train to Tehran there are several local day trains to Firouzkuh and Pol-e-Sefid allowing to admire the landscape. Hamedan (Ecbatana): This important historical city has recently been connected by railway with trains to Tehran and Mashad. Kashan: The railway station is on the edge of the historical town and best served by Pardis express trains as well as numerous overnight trains to all destinations in central and south eastern Iran. Kerman: the station is about 10 km south of the city center. Convenient overnight trains from and to Tehran as well as day train to Yazd offer daily connections. Khorramshar: not very much a tourist destination, the city has a weekly ferry connection to Kuwait city. The passenger pier is just 3 km from the railway station. The border crossing to Iraq (Basrah) is about 15 km west. Railway has been finished up to the border at Shalamcheh but is still to be completed on the Iraqi side. Qeshm Island: the biggest island in the Persian Gulf has a marvelous nature - a recommended tourist destination for those who love extraordinary landscapes and the charm of traditional villages and family hospitality. Frequent ferry boats connect Bandar Abbas port Haqqani with the town of Qeshm. Bandar Abbas railway station is about 4 km from the port and is best connected by taxi. Kish Island: the most popular seaside resort in Iran is best reached by plane. Ferry boats connect to Bandar Lenghe which is still 200 km to the next railway station at Bandar Abbas. Mashad: the second largest city of Iran has few tourist attractions but after Tehran it is probably the best connected place by railway with direct trains to almost every part of the country. Overland travellers to Turkmenistan - if there are any - will have to change at the central station for the train to Sarakhs. Until the completion of the railway connection to Herat it is also a convenient station to the border crossing to Afghanistan at Dogharoun (240 km), although Khaf station (100 km) is nearer to the border but has only few rail connections a week. Nain: the beautiful town of Nain has a railway station about 40 km to the north east with connections to Tehran, Kashan, Yazd, and Kerman. Natanz: 12 km east of this ancient town is the railway station of Espidan, where trains to Esfahan stop. But except during Noruz holidays most trains will pass during night times, so Badrud (30 km) or Kashan station (70 km) are probably better options. Pasargade: nearest railways station is Sadatshahr (22 km), but you should inquire on timetables in Shiraz or Tehran. Alternatively a taxi from Shiraz (120 km) or Eqlid station (130 km) would be a good solution. Rasht: not a tourist destination itself, the city near to the Caspian sea is an important hub to reach both destinations on the sea shore or in the Alborz Mountains as well as a passage to Azerbaijan. The railway to Qazvin and Tehran will be completed within a few years but actually the nearest railway station in Qazvin is still 170 km away. Sari: the provincial capital of Mazandaran is the hub to reach popular seaside resorts on the Caspian sea like Babolsar or Amol and the natural reserve of Ashuradeh peninsula. The railway station is right in the center. Shiraz: one of the most interesting tourist destinations in Iran has been connected to the railway network in 2009. The railway station is 20 km westward outside of town and has trains to Esfahan, Tehran and Mashad. Shushtar: the UNESCO world heritage site on the Karun river is connected with daily trains from Tehran and Mashad. Susa (Shush): the archaeological site of Susa is next to the modern town of Shush, which has its own railway station on the Tehran-Ahwaz line about 4 km from the location itself. Tabriz: the most important tourist destination in the Iranian Azerbaijan Region was the first Iranian city being reach by railway in 1914 and has a large station west of the center. It is the first stop in Iran of the Trans-Asia-Express from Turkey and has connections to Tehran, Mashad and Jolfa (electric railway), the border town to the Azeri enclave of Nakhicevan. Actually there is non border crossing rail service there but crossing by foot or taxi is possible. Tabriz station is also the hub for reaching other interesting tourist destinations in the region like the village of Kandovan (35 km), lake Urumieh (70 km) and the ancient Armenian churches in East Azerbaijan. Yazd: the fascinating desert city with its windcatchers is well served by train with a station 5 km south of the center. 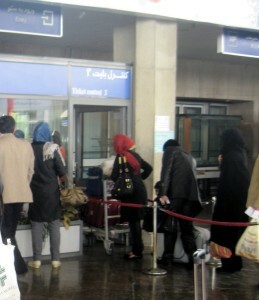 Pardis express trains to Tehran, overnight trains to Mashhad and Bandar Abbas as well as day trains to Kerman and Esfahan are among the available connections. Zanjan: the old Azeri city has a railway station right in the center with Pardis express trains to Tehran and several overnight trains to Tabriz as well as a stop of the Trans-Asia-Express. Tourist destinations like Takht-e Soleyman (130 km) and Soltanieh (40 km) may be joined by taxi. Soltanieh has its own train station at 4 km, too, with a few trains stopping there. Zahedan: not a tourist destination but the most eastern railway station of Iran and the Eurasian standard gauge network, it is the changing station to the Taftan Express to Quetta in Pakistan. 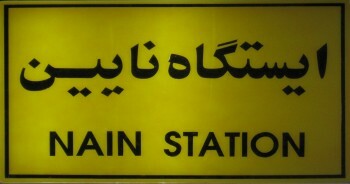 Although both the daily trains from Tehran and the broad gauge service share the same station, an overnight stay in this rather insecure town is mandatory as the train to Pakistan leaves in the morning and missing this connection which will travel only twice a month is not recommended.